Schools and youth groups across Northern Ireland are getting ready to take part in this year’s Anti-Bullying Week, which runs from Monday 12 November 2018. 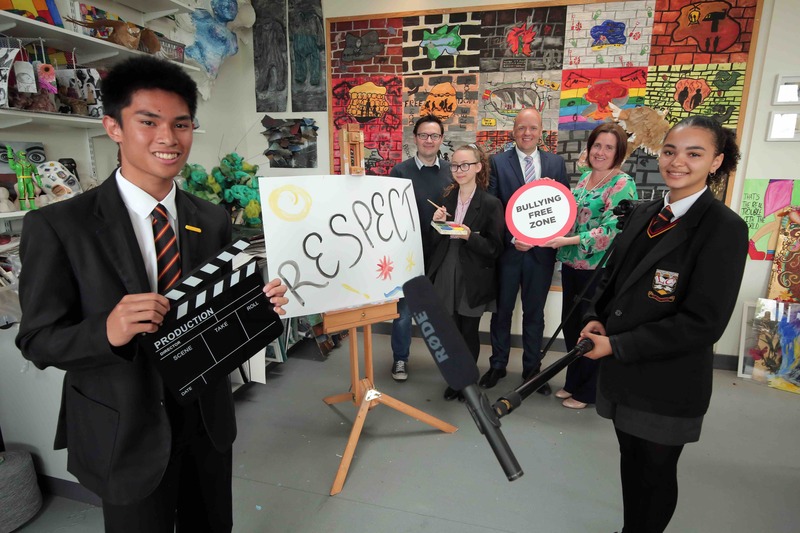 Under this year’s theme of ‘RESPECT, the week-long campaign aims to support schools and youth organisations and encourage children and young people to think about what respect means to them, what it feels like to be respected and how they show respect to others. This initiative explores how respect for others can build an anti-bullying culture in schools and communities. Anti-Bullying Week has become an integral part of the school calendar with more than 600 schools, youth groups and organisations getting involved this year. “Anti-Bullying Week ensures that awareness of bullying is raised by schools and the wider community in order to increase understanding of its impact. The Northern Ireland Anti-Bullying Forum provides a free resource pack to registered schools and youth organisations across Northern Ireland, which includes presentations and workshop plans, as well as themed posters. Mr Kane continues: “The focus of this year’s Anti-Bullying Week campaign is on the theme of respect. We will be encouraging children and young people to think about what respect means to them, what it feels like to be respected and how they show respect to others. “As a visual representation of individual support for anti-bullying throughout ABW18, we are calling on everyone to ‘Wear Yellow 4 Respect’. It could be a yellow hat, yellow socks or a yellow tie. Perhaps a pair of yellow trousers, a yellow jumper or yellow shoes. Even yellow shoe laces – everything counts! Anti-Bullying Week 2018 (ABW18) will be launched at Belfast Harbour Commissioners Office on Monday 12 November 2018. It will include a special awards ceremony to celebrate this year’s anti-bullying creative arts competition. The competition provides a platform for children and young people to champion anti-bullying messaging and convey their views on how bullying should be tackled. A series of events is scheduled for the week including a special screening of ‘Time to Stand’, a short film that Cinemagic recently developed with support from the Urban Villages Initiative*, which is a key action of the Together: Building a United Community (T:BUC) strategy. The Time to Stand film has been informed by members of the Executive’s Racial Equality Subgroup and aims to help young people tackle racism and bullying. The film will be used by schools and youth projects across the Urban Village areas and will be made available on a regional basis.